Most moms cry on the first day of school. They watch their babies step onto that big yellow bus, faking smiles and putting on excitement for the sake of their children. Then that bus pulls away and they pull out the tissues. It’s hard to explain really. I want my kids home and I long for summer all year. I’ve never been one to celebrate with a mani/pedi that first day of school in September as if I’ve re-asserted my freedom from the constraints of children. I cannot wait for summer to begin. But somehow that last day of school for me is like the emotional upheaval of making it to the top of Mt. Everest and back. Not just dragged our tired behinds across the finish line, either. We had a great year and I’m so proud of these girls and all they’ve learned and how they’ve grown. Thank You, Lord. You answered my prayers. You gave them great teachers. You gave them success and helped them shine. You guided them through a million tiny and seemingly not-so-tiny decisions and worries. You brought us right on through and onto the other side and I am just so thankful. I’ll cry a bit. And then maybe I’ll flop right down on this new shore and take a nap because this momma is plumb wore out. There were times that I thought I could not make it if one more child brought home an unexpected project for school. And I’ve discovered that I really do have a “look” that I flash whenever my child brings home a handwritten note in her best cursive writing asking for a playdate this Saturday when we have 12 other activities already on the weekend agenda. But here we are. The last day of school. I wonder how the disciples felt climbing out of that storm-tossed boat after fighting for their lives and stumbling in their faith right before the calm. Did they crawl out of that fishing vessel, soaking wet, panting, dragging out one limb at a time and then stretch themselves out in the sand until they could catch their breath? Or did they hop out of there totally unflustered, like they hadn’t been screaming for rescue just moments before? Something tells me they didn’t just shrug that typhoon off and move along. Maybe they took the time to cry and thank God for salvation. I knew we’d make it, though. 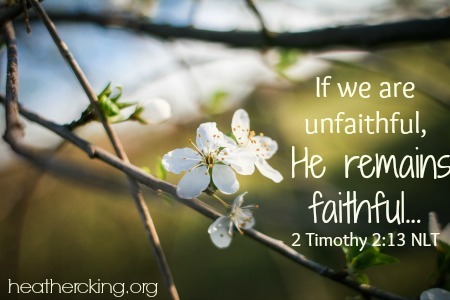 At times it felt like I was hanging on for dear life, but I knew He is faithful. God’s grace does that. It holds us up and carries us on, and our calling is never too much for Him to handle. Too much for us? All the time. Too much for Him? Not for a second. So we throw the full weight of our survival onto Him, casting those cares over and over onto shoulders strong enough to carry them. We trust in His promise. Those storm-weary disciples could have done this. Jesus never abandons us halfway. If He makes a promise, we know He won’t abandon us in the boat. He’ll take us to the other side. So the storm rages. So your boat groans and creaks. So those around you start scrambling into life vests, preparing to abandon ship. God has promised to take you to the other side. He is faithful and He will do it. I’m so glad, Lin! We are so blessed by His faithfulness to bring us through!